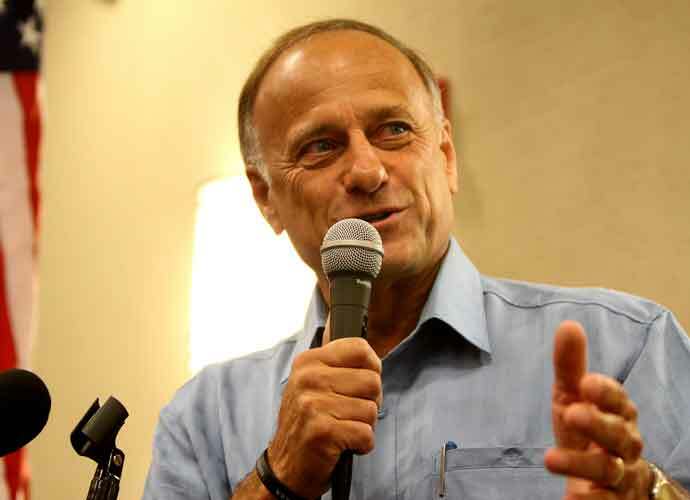 Iowan Republican Congressman Steve King faces backlash after retweeting a known Nazi sympathizer. King retweeted alt-right British activist Mark Collett‘s anti-immigration post this past Tuesday. As former chairman of the Young BNP, Collett is well-known for his Neo-Nazi views as well as his anti-immigration and homophobic rhetoric. The young activist was previously featured in the 2002 Channel 4 documentary, Young, Nazi, and Proud in which he espoused his admiration for Adolf Hitler and the ideals of the Nazi Party. Collett recently tweeted a screenshot of a Breitbart article titled “Vast Majority of Under-35 Italians Now Oppose Mass Migration,” and commented, “65% of Italians under the age of 35 now oppose mass immigration. Europe is waking up…”. King then retweeted the post, adding “Europe is waking up…Will America…in time?”. On immigration, King previously declared that diversity is not an American strength. The congressman has also endorsed of Dutch right-wing leader Geert Wilders view that “mixing cultures” leads to a lower quality of life. More recently, King drew nation-wide attention after posting a meme mocking anti-gun activist and Parkland school-shooting survivor, Emma Gonzales. Rather than removing the Collett retweet in response to criticism, King has since doubled-down on his stance by reposting the same tweet earlier today.